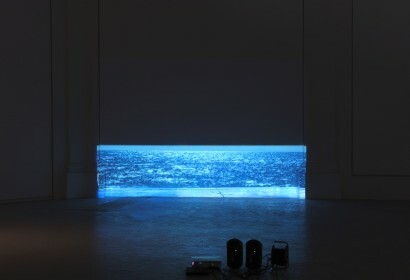 The video work is a reflection on space and perception. 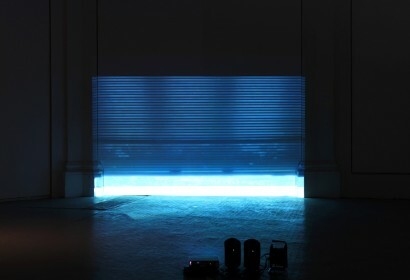 The senses sharpen in the dark and are then overwhelmed by the strong light of a wider space. 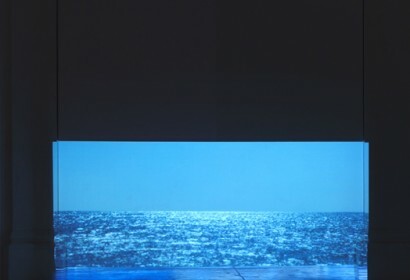 A tribute to Edward Hopper’s Room by the Sea, the rattling, mechanical movement of the rolling door shutter clashes with the opening of the horizon onto the sea. The shutter as a diaphragm between two dimensions. Besides the enchantment of finding oneself in an elsewhere with respect to what we thought, the thing that fascinates me is the idea of losing oneself and becoming indistinct in the light. La video proiezione è una riflessione sullo spazio e sulla percezione. I sensi si acuiscono al buio per poi essere sovrastati da una luce forte di uno spazio più ampio. Omaggio a Room by the sea di Edward Hopper, lo stridore del movimento meccanico della serranda si scontra con l’apertura dell’orizzonte sul mare. La serranda come diaframma fra due dimensioni. Oltre l’incanto di trovarsi in un altrove rispetto a ciò che pensavamo, la cosa che mi affascina è l’idea di perdersi indistinti nella luce.